I am really looking forward to this year in school and we have lots of exciting things planned already for our class. I will keep this page up to date throughout the year with information and photographs so that you can see all of the wonderful things that happen in Year 5. I am really pleased that we have made a great start to the year already with 100% attendance in the first week! The children and I are hoping to be the attendance champions this year so please help us to keep this up. We all are looking forward to a fantastic school year! We have a new reading rocket in class to record how many books we can read this year. Each child also has a bookmark to record their progress and will move up on the rocket after every 5 books they read. The children are very excited about this and some have already set their sights on reading 50 books in Year 5! If you could encourage your child to read at home as much as possible and listen to them read on a regular basis this will really support them in achieving their goals. Please sign their reading record as often as you can to help us to keep track of their progress and reading at home. Homework and spellings will be sent out on a Friday and the children can return their books in the green tray any time between Monday and Wednesday to earn their dojo points. The weekly spelling test will take place on Friday mornings - please try to practice the spellings at home as this does make a huge difference. I have given out letters about lots of exciting after school clubs starting next week and I am glad that lots of children in Year 5 have signed up already. If you are interested in joining any of our clubs please bring back your letters and if there is any information you need please ask. Year 5 are very lucky to have the military coming in to work with us every Thursday this term for the whole afternoon. Please ensure the children have their full PE kit on Thursdays so that they are able to participate every week and take full advantage of this great opportunity. We will also be having bikeability sessions in October (more information to follow). If you need to build up your confidence riding your bike before then try to have a practice while we still have some nice weather! The parent planner below is a summary of what the children will be learning in each subject this half term. You will also find this information on the paper copy that has been sent home with the children. The children took part in two full days of cycle training with our visitors, beginning by riding their bikes on the playground and then going out onto the roads around school. The course aims to make the children better, safer cyclists and equip them with the skills needed to ride their bikes confidently and safely in the road. The children worked towards their Bikeability Level 2 qualifications and were proud to receive their badges and certificates in assembly as recognition of their achievement. 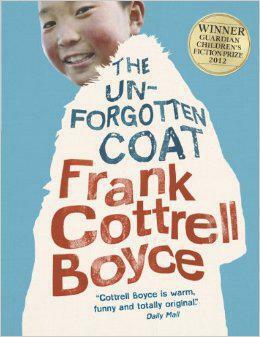 Our text for this unit was The Unforgotten Coat by local author Frank Cottrell Boyce. The children loved the story, which was set in Bootle, and were really engaged as a result. The boy in the story took lots of photos using his Polaroid camera and so the children were very excited to take their own. we created freeze frames of scenes from the story and took photos on a Polaroid camera for our display. Thank you for supporting our 'Brighten Up Your Harvest' event at school. The children looked great in their bright colours and the money and food donations collected will be a great help to people in need. Our first six weeks of Military School have been thoroughly enjoyable. The children are showing great enthusiasm and really getting stuck in during the sessions. They have been focusing on team work for the first half term and have been developing their skills and understanding in this area. The challenges and activities the children have been involved in have stretched them in many different ways and they are developing new skills all the time including communication, logic and leadership. 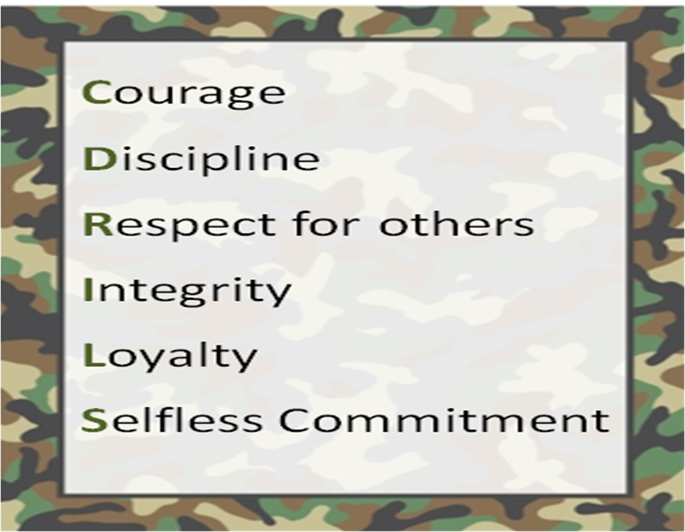 They are also developing their CDRILs values (see below) such as discipline, respect and selfless commitment. They have also completed a course in resuscitation and first aid as part of the programme. We are looking forward to continuing with this over the next six weeks. We had our first Compact enterprise workshop of the year this week and the children worked wonderfully in their teams. Each team created their own cafe business, designing a healthy menu for their cafe and presenting their ideas to the rest of the class. The task involved the children taking on different roles and using lots of skills including Maths for purchasing ingredients, healthy eating understanding in their menu design and Art and Design in the production of their menu and sample food basket. In Science we are continuing with our topic of Properties and Changes of Materials and the children have been conducting investigations into thermal conductivity and solubility. the children are really enjoying their investigations in Science and are developing their skills in working scientifically. We really enjoyed India week in Year 5. We learnt about India in class and then had the chance to have Mehndi on our hands and bindis on our foreheads thanks to some very kind parents. We also tasted some homemade Indian foods - the onion bhajis were very popular in our class! Our RE topic for the week was Hinduism and the children really enjoyed learning about the Hindu gods and the pilgrimage Hindus in India make to the River Ganges. On Friday we had a fantastic assembly of Indian stories and dancing - a big well done to Charlize in our class who danced beautifully in front of the whole school as part of this. We then finished our week with the children writing some excellent poetry about India. Our girls were given the opportunity to visit St John Bosco this week to take part in a Science Booster class. They spent the afternoon in the lab working with the teacher and some sixth form students and were a real credit to our school with their excellent behaviour and enthusiasm. They learnt all about the heart and were given the opportunity to dissect a lambs heart which they really enjoyed. The girls came back full of enthusiasm for Science and with ambitions to become doctors! We are really looking forward to our next visit. Over the last three weeks the focus of the children's Military School sessions has been fitness. We have learnt all about speed, strength and stamina and have taken part in exercises to find the strongest and fastest in our class. This week the children took part in the bleep test to test their stamina and they all did really well, showing real determination and pushing themselves to the limit. However, two boys in our class did exceptionally well! Josh and Joash actually completed the test and beat the tape, showing an incredible level of fitness and endurance as well as mental strength. Our two Military School trainers said they have never seen any child get anywhere near that far in their visits to hundreds of schools. We were all very proud of the boys who supported each other to make it to the end. Well done! Thank you very much to everyone who supported our Spotacular day for Children in Need on Friday. The children looked fantastic in their spots and Pudsey outfits and we raised lots of money to help such an important cause. The children had a fun filled afternoon taking part in the Military School Assault Course as a reward for all their hard work during the programme so far. In English we have been learning all about legends and as part of this topic we found out that legends were often passed down through generations as oral stories. We listened to some legends, decided what we thought made good storytelling and then decided to see if we could be good story tellers. We prepared our own versions of the legend of Robin Hood and went to Year 1 and 2 to tell our stories. The younger children really enjoyed listening to us and asked if we could come back again to tell more stories! Thank you to all the parents, carers, family and friends who came to support the children in their passing out parade. The UK Military School leaders were very proud of the way the children presented themselves and it was wonderful to see them all receive their medals and awards. Congratulations to Joash who was selected as best recruit for the course and well done to all of the children for their hard work and commitment during the programme. They have thoroughly enjoyed it and have also developed lots of important skills. This year we had the first 'Philly's Got Talent' competition. Lots of children auditioned and demonstrated their fantastic and varied talents including dancing, gymnastics, singing, stand up comedy and clowning. We voted for two acts to represent us in the final. Rhys and Holly sang really well together and Kornel did a fantastic version of the cup song winning the overall competition. Congratulations to everyone who created an act and auditioned! Wilmott Homes are building at the bottom of Lower Lane and in November they came in to teach us all about safety linked to building sites. As it was Road Safety Week they also launched a competition and asked the children to design a poster or produce a piece of writing linked to road safety. The quality of entries from our class was excellent and I am proud to say that both the winner and the runner up for KS2 were in our class. John Brady received a brand new bike as a prize for his winning poster and Madison Murphy won an art set as the runner up. Both pieces of work will be blown up and displayed on the hoarding of the building site in the New Year so make sure you have a look at their excellent work as you walk past. Welcome back to school! I hope you and your families enjoyed a peaceful Christmas together and are looking forward to the year ahead. There will be lots going on again in school this term including swimming lessons for our class. Swimming will take place every Tuesday and is an important part of the curriculum which I know the children are really looking forward to. Please find below the parent planner which is a summary of what the children will be learning in each subject this half term. You will also find this information on the paper copy that has been sent home with the children. Well done to all the children who signed up to take part in our spelling bee, they all worked really hard to learn the long list of spellings and did themselves proud in the Year 5 competition. Charlize, Joash and Eve were our finalists who were chosen to go head to head against the top spellers in Year 6 to find the Upper KS2 spelling champion. After a tense final and a sudden death round Charlize and Joash were crowned joint winners as they got every single spelling correct! Congratulations on this great achievement. We had a visit this week from Professor Fluffy and two of her friends for the University of Liverpool. The fun and interactive workshop helped the children to understand more about university and the opportunities available to them. Our new Science topic is forces and we have been really enjoying our learning so far. Here are some pictures of the children measuring forces. We took part in our first experiment for the BBC's Terrific Scientific project. We used blue food colouring on our tongues to find out if we were supertasters. We discovered that there are 8 supertasters in our class which is higher than the national average. We sent our results to the BBC and then watched the live lesson all about taste and digestion. We really enjoyed the experiment and the children are looking forward to the next one which is coming up soon. This week our school wanted to find out more about Chinese New Year. In Year 5 we looked at the story of how the Chinese zodiac began and the different animals that make up the 12 year cycle. We then practised writing the Chinese symbols that represent each of the animals. We found out that in our class lots of the children were born in 2006 which is the year of the dog so these children made their own frames with the symbol for dog. People born in the year of the dog are said to be faithful and honest. They like to listen to people’s problems and to help them. Everyone else in our class was born in 2007 which is the year of the pig so they made their own frames with the symbol for pig. People born in the year of the pig are said to be honest, kind and they make good friends. But they can be untidy sometimes. We recognised this in some of our friends! We also made a frame for each of the other animals in the zodiac to show the rest of the school in our special Chinese New Year assembly. The children did a fantastic job of presenting their learning to the other children and we also learnt lots of interesting things from the other Year groups. The girls from our class were lucky enough to go on their second visit to St John Bosco and this time they were looking at electricity. They really enjoyed working with circuits and completing different challenges and came back enthusiastic about Physics. On Friday we took part in NSPCC number day, playing different Maths games and having lots of fun with Maths. We also wore odd socks and raised money for an important charity - thank you to everyone who sent in a donation. We had an opportunity to develop our teamwork and enterprise skills today with another Compact workshop. The children were challenged to create a pet food product, including designing the packaging and coming up with unique selling points. Each team also created a storyboard to show how they would advertise their product and then presented their adverts to the other teams. Thank you to Year 4 for organising our pancake races today and teaching us about the different traditions belonging to different parts of the UK. We have really enjoyed learning about the Ancient Maya in History this half term. There were lots of opportunities to make links work practically and to with other subjects such as Maths and PE, below are some photos of us representing numbers as the Ancient Maya did and playing a traditional Ancient Maya game of Pok-ta-pok. We had a fantastic day today celebrating World Book Day. We started with an assembly and a chance to show our brilliant costumes to the rest of the school and then continued with book and reading themed activities during the day. Thank you to the children who brought in photos for the extreme reading competition - you found some very interesting places to read! We have taken part in a second experiment for Terrific Scientific all about time. We had to keep sleep diaries before and after the clocks changed this weekend and record our reaction times on Friday and Monday by catching a ruler. The aim is to find out whether the clocks changing has had an impact on our sleeping patterns or levels of alertness. We had lots of fun measuring reaction times and some of the children were very alert. We learnt why the clocks change and about time zones around the world which linked really well to our topic of Space in Science. Thank you to all of the parents, grandparents and other family members who joined our class for a craft afternoon this week. We decided that our crafts would be linked to our current Geography topic of Brazil so we created rainforest scenes, carnival headdresses and pictures in the style of Brazilian artist Romero Britto. Today we had a really interesting and informative experience, helping the children to think about the world of work and possible future careers. Representatives from 14 companies working in different industries set up stalls in our hall to create a careers carousel especially for Year 5. The children prepared questions for the visitors in advance and had a chance to move around to each stall to meet the representatives and ask questions and have discussions. There were also fun activities and competitions provided by the visitors. The children had a fantastic morning and the visitors were extremely impressed with their discussions and interactions, with 5 children given an award for their unique and insightful questions or comments. Well done to all of the children who created beautiful Easter bonnets for our parade in school - you all looked fantastic and a lot of effort had clearly gone in to your designs. We are so pleased that we were the attendance winners for the last half term and today we went to Frankie and Benny's as our reward. We made our own pizzas and thoroughly enjoyed eating them!